The Ruger 10/22® Competition Sear Kit lightens the trigger pull and smooths the trigger return. Hand stoned engagement surfaces. 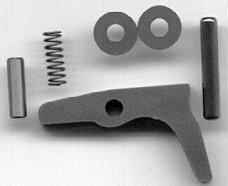 Includes a new sear, extra power sear spring, and two .004" trigger shims. This sear, when used with proper engagement of the factory hammer, will produce a trigger pull of approximately 2.25 - 2.5 lbs. See many more products for your 10/22 at our Ruger 10/22 Main Menu!